= Mammillaria crucigera subs. tlalocii f. cristata hort. Description: Mammillaria crucigera subs. tlalocii best known in cultivation as Mammillaria tlalocii is a globular cactus, solitary or clumping dichotomously. 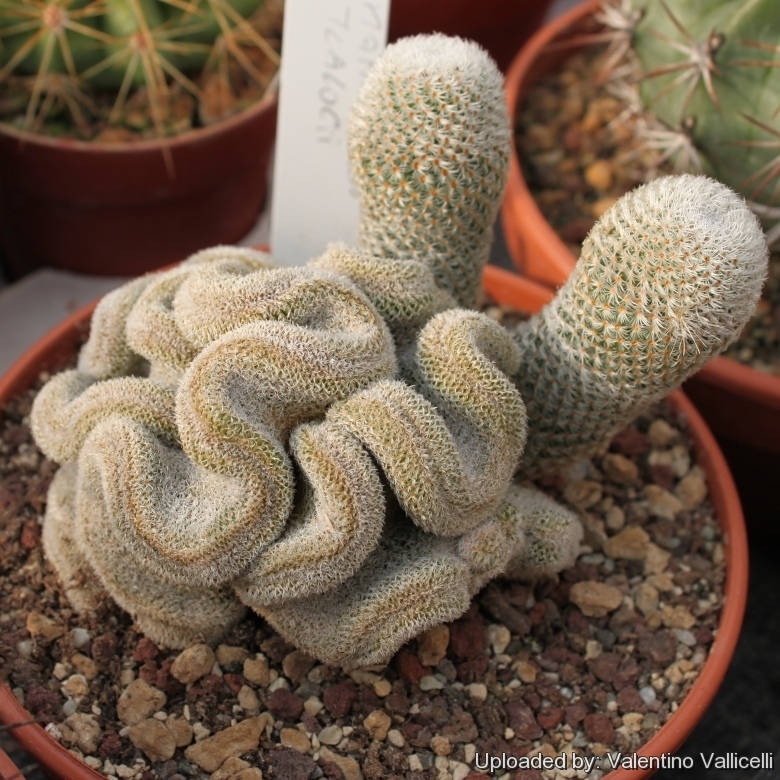 Crested form: The crested form Mammillaria crucigera subs. tlalocii f. cristata is very rare and sought after by collectors, for its unique features. Stem: Fan shaped, forming brain shaped mounds up to 20 (or more) cm wide. The axil of tubercles is white-woolly. Radial spines: 16 to 22, glassy white, 1 to 2 mm long, the longer sideways pointing. Central spines: On the areoles at the apex of the plant, with age, may appear a single longer brown-black central spine 6-10 mm long. Flowers: Carmine-pink, 12 to 14 mm long, 8 to 10 mm wide. Flowering time: Blooms in late winter, early spring.